The etiology of gummosis was elucidated in South Africa by Zeiljemaker (1971), who demonstrated the pathogenic association of P. nicotianae. Santos et al. (2005) also recorded this species in black wattle in Brazil. Other species found were P. boehmeriae and P. meadii in South Africa (Roux and Wingfield 1997). Phytophthora boehmeriae was also found in Brazil (Santos et al., 2006). In 2016, P. frigida was reported causing gummosis in trunks of black wattle trees in southern Brazil (Alves et al., 2016). Symptoms of gummosis on black wattle (Courtesy A.F. dos Santos). The bark of black wattle is used for the extraction of tannin to be used in the leather industry. Additionally, wood of black wattle is utilized in the production and export of wood chips for cellulose (Mochiutti 2007). 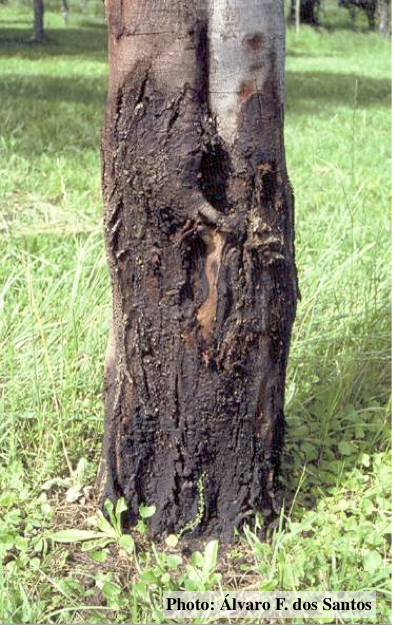 Trees with gummosis interfere with the bark removal operation, reducing production. Timber with symptoms of gummosis is also unsuitable for use in the production of chips (Santos et al. 2007). Phytophthora frigida has a limited number of hosts, occurring only on Eucalyptus smithii and Acacia spp. (Maseko et al. 2007, Alves et al. 2016). In Brazil, it is found only in black wattle (Alves et al., 2016). In black wattle plantations, it is not possible to differentiate the symptoms of gummosis caused by P. frigida and P. nicotianae. 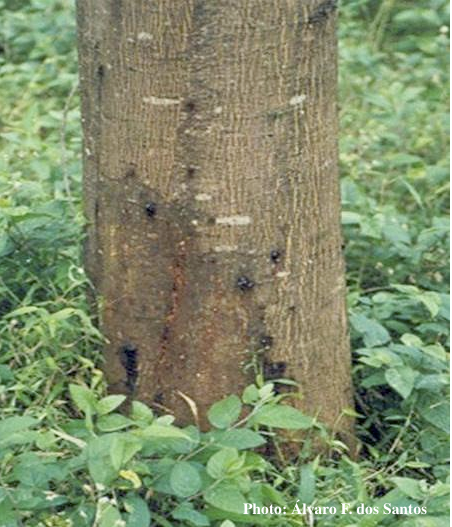 The two pathogens cause similar symptoms characterized by necrotic lesions, with or without gum exudation, that are localized in the basal region of the trunk, not reaching heights greater than 1.5 m (Alves et al. 2016; Santos et al. 2005, Santos et al. 2007). For more information about Phytophthora frigida, visit our Pathogen, Education and Management materials, and Reference sections.